I’ve been thinking and working on this for almost 8 months and the time is finally here. It’s time for the 4th Annual Life of an Architect Playhouse Competition!! Last years event was a spectacular success and I am hopeful that we can have similar – and possibly greater involvement this year. At the end of last years playhouse competition, we were able to build two playhouses. This year I know that we can build two, but there is a very real possibility that this number will grow to five when it’s all said and done. That would be amazing … really amazing. This competition has always been a good thing and has allowed a lot of people to design a playhouse (cool) for free (even cooler), have their playhouse design featured on this site (okay, maybe that’s not that big of a deal) – BUT – they are helping spread awareness and helping out a charitable organization that benefits abused and neglected children. If nothing else, this is exactly the sort of thing where designers should use their creative super powers. I thought I would start this year call for entries with a quick look back at last years playhouse winners and their final constructed playhouses. The Red Ball Playhouse – designed and submitted by Levente Skulteti from Brussels, Belgium. This was a very popular playhouse – and by far the most challenging playhouse that we’ve built so far. While this playhouse was on display, there was a lot of picture-taking with people standing in front of this playhouse. I can guarantee that this was the first of its kind on display. The Hollow Treehouse – designed and submitted by Kania P. Anggriany from Bali, Indonesia. The thing that most people seemed to be the most intrigued by with this playhouse is that there was a second floor level. It’s almost impossible to meet the height restrictions and have a second floor that is safe to occupy but this treehouse themed playhouse managed to pull it off. That was a quick look back at last year’s 3rd annual Life of an Architect Playhouse Design Competition winners … let’s get to the details of 4th Annual Life of an Architect Playhouse Design Competition! When it comes to how much these playhouse cost to build, there are a lot of people who don’t actually know how much stuff costs and that’s okay. The point is that you need to be mindful of the cost as you are designing your playhouse. This means that designs that require CNC routers, GFRG castings, or cast in place stainless steel, it will most likely not advance to the final round. I would also strongly advise you to avoid using any glass block if you want to get past my personal prejudices regarding that loathsome material. Entries can be submitted by individuals or by a team, it doesn’t matter and it will not be a consideration during the judging. I will also feature all the entries that advance onto the final judging round here on the site. Registration starts immediately – fill out the form above and you are good to go! You have approximately 8 weeks to develop your concept and prepare your digital submission board. Designing these playhouses should be fun and as a result, don’t have to be so complicated that you have to design some new algorithmic computer software to help resolve your plan geometries. April 20th (Monday) – design submissions will be due. Deliverable will be a 24″x36″ vertically oriented JPG file format emailed to bob@lifeofanarchitect.com (file size not to exceed approximately 5MB). In the case of multiple entries by a single designer (person or group), please send each entry by itself. Do not place any personal information (like your name) on your digital submission – I want to keep things fair during the judging process. April 27th (Monday) – initial round of judging (by celebrity judges not yet selected) to bring number of entries to be judged to manageable number of finalists will be complete with the finalists announced here on the Life of an Architect website. May 4th (Monday) – the final judging round will be completed and the winners will be announced here on the Life of an Architect website. June 1st (Monday) – construction documents are due to the contractors (4 weeks to complete – easy) IF you can get them done sooner, I’m sure the contractors would appreciate the additional time to build your playhouse masterpiece. 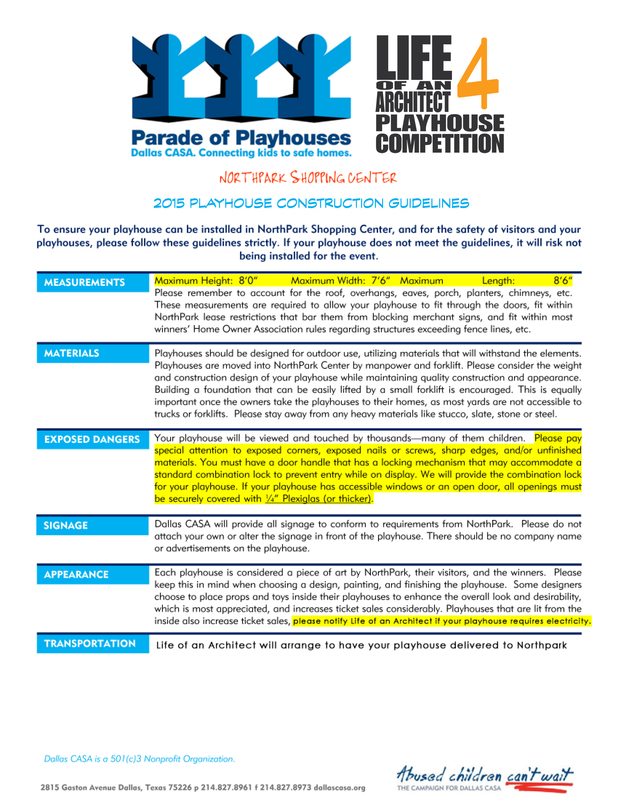 All playhouse design competition winners are required to prepare construction drawings for their entries which will be submitted to their designated contractor. In the possibility that you are unable to prepare your own construction drawings (because you don’t know how, not because you get busy with other things) with a little heads up, I have people who have offered their time and skills to prepare constructions drawings on your behalf. Seriously?!? How many competitions have that offer on the table? Possibly other goodies including, but not limited to, a custom Life of an Architect Design Competition t-shirt (retail value $25+ but the actual value is priceless), I am starting to solicit stuff from people so you’ll just have to take it on faith … this is a small time competition, there’s only so much I can take on myself. If you are reading this and want to kick something into the pot to be awarded to the winners, the cream of our society, just drop me an email. There might be other things but that should (hopefully) be enough to get you to enter a design. If you want, here is a link to every post I’ve written on Playhouses some of these posts include the actual construction drawings used to build the playhouse. You will also find past entries to see how presentation boards were assembled, loads and loads of valuable data. Everything that you want to know can be found in these previous posts so use this resource wisely, Grasshopper. You’ll need to know some basic parameters in order to actually design one of these playhouses. Click here for the playhouse guidelines – this is the document that tells you the size constraints. Very Important!! Protection – since these playhouses are on display in a mall, they must have all openings either closed or protected so that enthusiastic children don’t actually play on the playhouses during this time. A common solution is to put Plexiglas over the openings but the amount of openings you may have can make this solution difficult to execute. Things like slides and rock walls are frowned upon because they are difficult to protect without resorting to making a giant Plexiglas cover. Think of these playhouses more like little buildings than structures you would find on a playground. Final Plea – This should be a fun thing for you to do and the end result could be that your playhouse gets designed and raffled off to benefit some needy kids. Doing this sort of work is what fills your karma tank up … and the effort required is minimal unless your design wins and even then – not so much work. I really hope that I can get a good showing so that I can go to more people in the industry for funds next year and build more of these playhouses. Every part of this process will be well documented and represented here on the site, I hope you come along for the trip.